"They have only one product left – Russophobia, and they are selling it successfully." 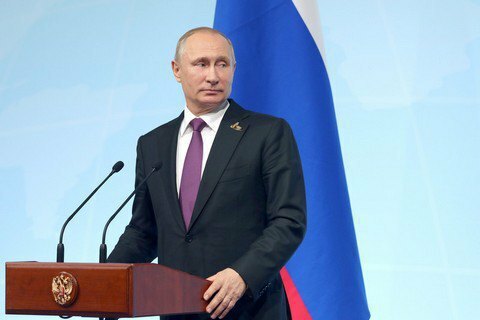 Russian President Vladimir Putin, who is behind the illegal annexation of Crimea and military incursion in Donbas, has complained about the Ukrainian authorities being Russophobic, according to UNIAN. Speaking at the G20 news conference in Hamburg, he said that "the interests of the Russian and Ukraine people – and I am fully and profoundly confident of this – coincide […] The only thing that does not coincide is the interests of the current Ukrainian authorities and some of Ukraine's political circles". He said that Russia "both Ukraine and Russia are interested in cooperating with each other, joining their competitive advantages and developing their economies just because we have inherited much from the Soviet era – I am speaking about cooperation, the unified infrastructure and the energy industry, transport, and so on". "But regrettably, today our Ukrainian colleagues believe this can be neglected. They have only one ”product“ left – Russophobia, and they are selling it successfully. Another thing they are selling is the policy of dividing Russia and Ukraine and pulling the two peoples and two nations apart. Some in the West like this; they believe that Russia and Ukraine must not be allowed to get closer in any areas. That is why the current Ukrainian authorities are making active and successful efforts to sell this product," he said. At the G20 summit, Putin discussed the Ukraine conflict with US President Donald Trump, German Chancellor Angela Merkel and French President Emmanuel Macron.